Remember that staple accessory of the 1980s? Two inches square, hard-to-touch buttons, and worn by the fashion forward like Marty McFly, Sting, and more recently Breaking Bad‘s Walter White. That was the beginning of wearable tech. And – though there wasn’t much of a market for computers that you can wear post-calculator watch, likely because the idea became relegated to the status of “nerd gear” – wearable tech will most certainly be a part of the future. Most wearable tech lives strictly in the health and fitness category, such as bracelets that monitor your heart rate or shoes that clock running speed and distance. OMsignal, a company out of Montreal, recently announced a shirt meant to be worn under your clothes or at the gym that’s loaded with compression sensors that monitor your heart rate, stress, and exertion levels. The shirt has a small computer that communicates with a smartphone app to give you instant access to your insides. There are obvious benefits when you combine wearable tech with fitness, but there are advantages of wearable tech beyond the gym. 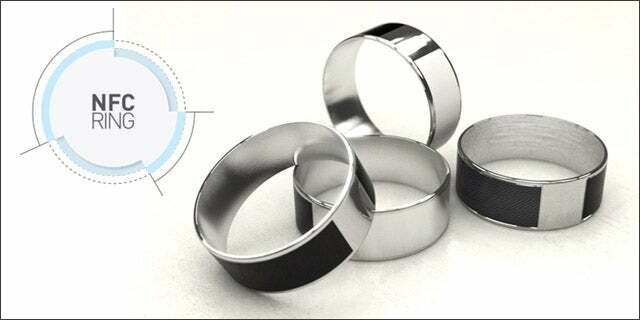 The NFC Ring, currently being funded via Kickstarter, is a piece of tech that (surprise) fits around your finger and can do anything from unlock your smartphone or your house, to share your contact info or WiFi password. The ring uses near-field communication (NFC), a kind of short-range radio communication. Bring your NFC Ring in contact or an inch or two away from an NFC enabled device and, click, things happen. The NFC Ring is loaded with two NFC sensors, one on the top side of the hand and a smaller one on the palm side. The top side of the ring is the public side. You can load your ring with any kind of information you like, contact info, Twitter handle, Facebook page, etc. The palm-side sensor is for the information you want to keep private, unlocking NFC-enabled doors and smartphones. The information is written onto the sensors though NFC writing apps, so what you program into the sensors can be as simple or as complex as you like. Designer John McLear seems to be open to sharing his tech. The ring uses open source software, so third parties can use the ring for nearly anything, and among the Kickstarter pledge benefits is an option that lets you 3D print your own ring (with McLear sending you the ring inlay). The rings don’t cost much, $28 to $55, and as of this writing McLear has raised over $250,000. The project will be funded on Monday, August 19, and the rings should ship about a month after. NFC technology has been around for awhile. Its beginnings were in RFID (radio frequency identification), which was invented in the early 80s, which incidentally was the height of popularity of another circular piece of tech – the calculator watch. Then as now, wearable tech is built to make the wearers life, your life, easier. And if the NFC Ring turns out to be as good as it seems, life will be easier because there will be less to carry. Specifically, keys.